The Austin College community mourns the death of Board of Trustees senior member Jesse R. “Ray” Thomas, a 1974 graduate of the College, on January 12, 2019, in Dallas. A Memorial Service will be held Saturday, February 9, 2019, at 2 p.m. in Austin College’s Wynne Chapel, followed by a reception in Mabee Hall of Wright Campus Center. 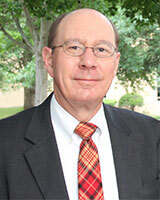 Ray served active terms on the Austin College Board of Trustees from 2000 to 2013, serving as chair of the Academic Affairs Committee for much of that time. He also was an integral member of both the Trustee Committee and the Strategic Planning Committee. He remained an active senior trustee until his death. Ray and his wife, Elizabeth (Black), also an Austin College graduate, were devoted advocates of the College and its students. They made several significant scholarship gifts to the College and supported numerous other initiatives, including construction of Wright Campus Center. Their generosity to the College and its students has been recognized on several occasions, including induction in 2013 into the Emily Austin Society, which recognizes especially generous lifetime and estate gifts to the College. Read the family’s full obituary or leave condolences and memories. Memorials may be made to the Jesse Raymond Thomas Endowed Scholarship at Austin College or to KCCure for kidney cancer research (1000 Dartmouth Road, Alexandria, Virginia 22314 or via its website).